Surrounded by forested mountains, this hacienda offers the true flavor of grand Mexican style. Gourmet cuisine, lush gardens, a complete spa, a mystical Temascal steam bath and a swimming pool all enhance your stay. 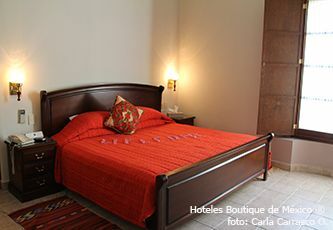 Exciting downtown Oaxaca is only a short drive away, and y will happily retire to your spacious and luxurious guest room at the end of the day. Located in a upscale residential area of the City of Oaxaca, lies Hacienda Los Laureles, secluded in the privacy of its gentle gardens. 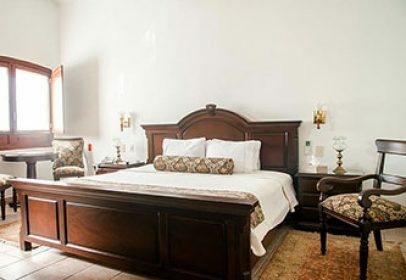 Surrounded by mountains and forests, this early 1800s hacienda offers guests the flavor of grand Mexican style in the unique ambiance created by its magnificent porches and columns, refined furnishings and exceptional service. Hacienda Los Laureles was constructed at the beginning of the 19th century and has been restored to perfectly blend with its extensive gardens amid flowers, mango and cypress trees, which guests can admire from the quaint solarium or from the shade of its long porches. This inspiring scenery is matched by the decor inside, where each corner has been carefully designed to ensure space and functional elegance with a streak of colorful Oaxaca in the paintings on the walls. 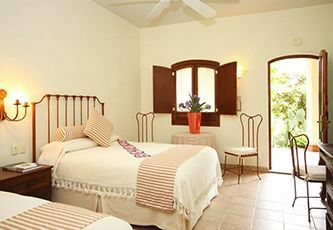 Guest rooms at Los Laureles are decorated in fine wood furniture and light-colored fabrics that lend a serene and soothing mood to fully enjoy the peacefulness of this luxurious and comfortable hotel. The owners have made a point of ensuring leisure and offer an array of services from conferences on the myths and healings in Oaxaca to a relaxing Temascal steam bath, which will cleanse your body and soul. After a refreshing break at Los Laureles, you will be ready to explore the mythical city of Oaxaca. Combine Oaxaca and Huatulco. Hacienda Los Laureles has a great deal showing you the best of both worlds: beach and one of the must amazing cities in Mexico. The gardens! 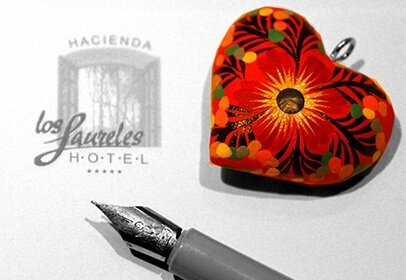 The owner of this hotel lovingly grooms the hotel´s central gardens. The hacienda-style architecture of Haciendad los Laureles makes these gardens the center-point of the hotel. Aerotucan.com.mx flies regularly from Oaxaca to Huatulco, allowing travelers to spend a few days in cultural Oaxaca and then move on to the stunning beaches of the Mexican south pacific. Taking cooking classes in the garden. The Spa. The peaceful location and the wonderful cuisine that await you. Travelers that enjoy visiting the town center with its hustle and bustle but that appreciate retiring to a quiet, peaceful space at the end of the day. 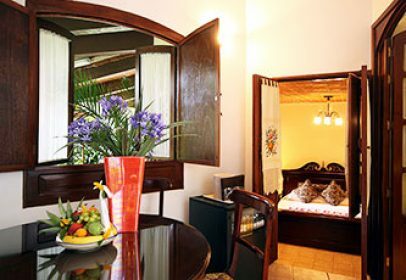 Staying at Hacienda los Laureles, you get great rest while still being close to all the attractions Oaxaca is famous for. 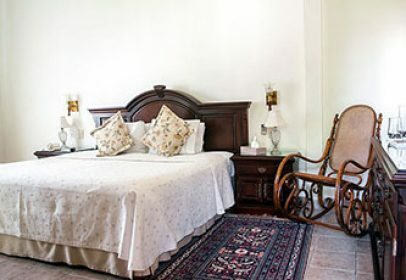 All rooms are tastefully decorated and include direct-dial telephone with computer data port, ceiling fans, 25″ satellite color TV with radio and remote control, mini-bar, safety deposit box, luxury bathrooms, bathrobes, fluffy towels, facial mirror, hairdryer. Queen, king or two double beds. Second-floor rooms have balcony overlooking the garden. First-floor rooms have a terrace at garden's edge. Slightly more spacious than the Deluxe Room, with king or two double beds, luxurious bathroom with bathtub or shower and balcony. King bed, private lounge with writing desk, patio or balcony, spacious bathroom with bathtub. Private lounge with writing desk, king bed, patio or balcony, spacious bathroom with Jacuzzi. Decorative fireplace, spacious bedroom with King size bed or two beds and extra-large bathroom with closet and patio overlooking the garden. No penalty will be charged for cancellations received 12 days or more prior to arrival date. Cancellations received less than 12 days prior to arrival date will result in forfeiture of deposit. For Holidays, no penalty will be charged for cancellations received 21 days or more prior to arrival date. Cancellations received less than 21 days prior to arrival date will result in forfeiture of deposit. Welcome cocktail. Coffee and local newspaper available from 7:30 – 9:00 am served at your doorstep or outside sitting area upon request. 19% tax not included. Additional person or bed with extra cost. Children under eight may share parents´ room at no charge. No children over one year old during Holidays. Maximum room occupancy: two adults and one child, and four adults in the Presidential Suite. Pets not permitted. The hotel can prearrange transportation from the airport via taxi with prior notice, the service has an additional cost. The trip is approximately 15 minutes. Releases pain and the muscle tightness, special attention to stressed, contracted and tired areas. Reflexology rests your feet and harmonizes your body. Reflexology rests your feet and harmonizes your body.Shiatsu Japanese massage along energy lines to provide harmony to body and mind. Therapeutic technique to align, adjust and release bone and muscular tensions caused by injury. Massage applying light aromatic oils over the body. A therapeutic touch added to your relaxation massage. The therapeutic touch of reflexology and aromatherapy. Aromatherapy enhances the effect on energy lines and muscles. Softens and purifies skin with a light body polish. For sensitive, dehydrated skin. Light polishing of body for thick dry skin. Moisturizing treatment improves blood circulation, energy and lymphatic drainage to firm, reduce wrinkles, shape body and reduce cellulite. Applied with electronic equipment based on color, sound, precious stones and natural body creams. Light exfoliation, massage and application of rich natural products to hydrate and nourish your hands. Light exfoliation, massage and application of rich natural products to hydrate and nourish your feet. Hydrates, nourishes, reactivates lymphatic drainage, and blood circulation, reaffirms, regenerates, lifts, eliminates wrinkles, clarifies, illuminates, tones, detoxifies and invigorates. Light cleansing treatment and massage with natural products to hydrate, polish and nourish your skin. Delicate cleansing, moisturizing and nourishing treatment with special clays obtained from the Tepoztecas volcanoes brought directly from Morelos City. Pamper yourself with a relaxing hydro-therapy massage in the Jacuzzi, with different products that will give your body everything needed. The aromas offer harmony, vitality, peace and balance. The natural wealth of the sea detoxifying and nourishing your skin. Twelve pressurized water jets self-regulated to relax all body muscles. Entire body exfoliation, hydro-therapy with Jacuzzi & Gems Beauty Facial. Entire body exfoliation and hydro-therapy with Jacuzzi. For this such special occasion, permit us to relax and pamper you. We practice yoga to discover the divine light within. At the same time, we receive many physical benefits. The body becomes stronger and more flexible, allowing the muscles to relax. A ceremony of reconciliation with the universal laws. When the body sweats, it cleans itself and begins to liberate all the tensions and worries. The scent of the medicinal herbs and the traditional chanting lead us to a higher level of relaxation and purification. Reservations can be made at the front desk. A 100% deposit is required to confirm your appointment. Cancellations and schedule changes received to four hours or more prior to appointment will not be charged a penalty. Late cancellations will be charged 50% of the scheduled treatment. No-shows will be charged 100% of the scheduled treatment. We recommend you arrive five minutes before your appointment. If you do not arrive on time, your treatment will suffer a time discount. Breakfast, lunch and dinner service in the casual atmosphere of its terrace or in the private lounge. International, Mexican and regional specialties with a touch of nouvelle cuisine. You cannot missed to stop at El Rincón de los Moles, an area where you can choose your Mole and the type of meat you will like it with, completely personalized. The bar area extends into a large solarium overlooking the extensive gardens.